[from Brian Goslow�s liner notes for the album] In the first half of the 1980s in the post-industrial landmine known as Worcester, Massachusetts (a/k/a/ Wormtown) -- a city whose two industrial complexes made it number one on the Soviet Union�s hitlist in case of war -- three wise men, accompanied by an equally strange entourage of followers and inventors, ignored all the rules of how to become successful musicians and created a unique legacy of their own, and with it, the era of "Peace, Love and Alienation." The journey began at Clark University, where two devotees of Dada terrorism, Seth "Xerox" Feinberg and "Egg" Al Nidle postered its campus with posters announcing "talentless guitarist and drummer seeking bassist and lead guitarist to form post-new wave pop pseudo-psychedelic band." It drew the attention of Kris "Trip" Thompson, a new member of the church of all things psychedelic and guitarist-without-a working guitar Mike "Doc" Michaud. They began practicing at the local community radio station, using only pizza boxes for a drum kit, and were not so politely asked to leave by half the station. 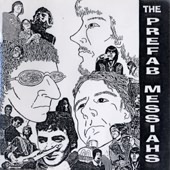 The other half demanded they play on the air, and soon afterwards, the Prefab Messiahs were on the airwaves asking the question, "Whatever happened to Cousin Artie? 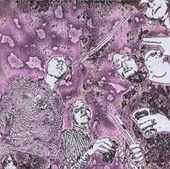 / He blew his mind out at a '60s party...," and intended or not (thanks to the fact the local underground club�s doorman was indeed a popular scenester named Artie, and still scarred from having been forced to attend Woodstock), the residents of Wormtown took it as a celebration of one of their own. With its Betty Crocker-like instant success and fame (or at least a good used clothing store) just around the corner, "Egg" Al decided to leave the performing line-up and like Gepetto and Malcolm McClaren, pull strings from behind the scenes (he attempted to bring Ronald McDonald into its lineup - but alas, failed by a single screw of pulling off the artistic coup of the century). He was replaced by Ringo, a Casiotone instrument whose existence irritated serious music fans, but delighted music lovers. When the group entered the Spring Rock Showcase at the city�s largest nightclub, which heavily the event on WAAF, the region�s biggest radio station WAAF, it attracted a large hard rock crowd, most of who were beyond stunned to see the Prefabs take the stage with Ringo - but not as horrified as when they learned the group had won its preliminary round enroute to the semi-finals. Their belief in their music earned the respect of Nebulas drummer Tony Serrato, who volunteered to replace Ringo. They took their prize and recorded "The 16th Track" and "Desperately Happy," and with a real drummer, rapidly became one of the city�s best live acts. Time constraints eventually forced Serrato to leave the band, and he was replaced by Billy Brahm, from Bobb Trimble�s equally mythical Crippled Dog Band.